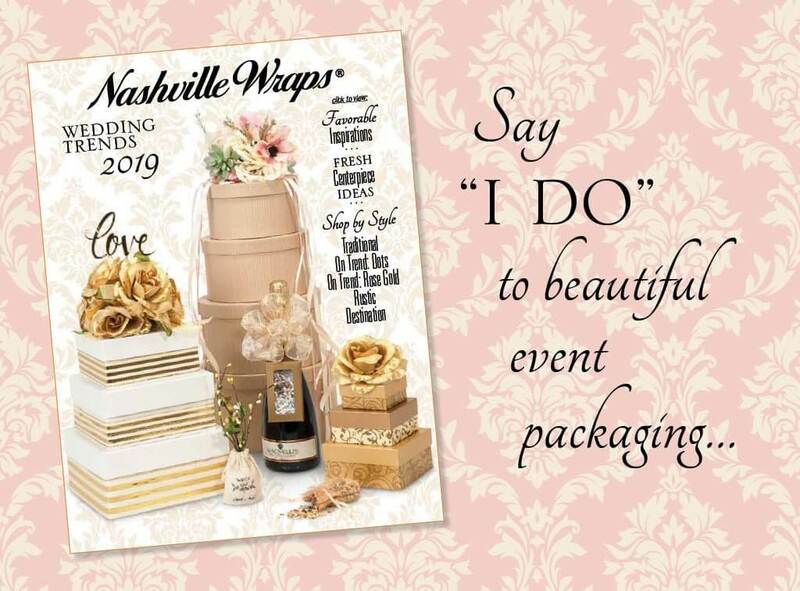 In our NEW Nashville Wraps Digital Wedding Catalog we set out to present our packaging using today’s top wedding trends as our organizational guide and to present a selection of our products in a clever new light. Packaging re-purposed! The artists at Wraps do quite a bit of trend research. Following their lead, we broke our wedding guide into popular trends. We started with the always popular Traditional Wedding. We presented golds, whites and silver packaging in this section. Then we moved on to a popular trend, Dots. We love how polka dots add a light-hearted air to even the most formal design theme. Next, we introduced our take on a major trend, Rose Gold & Copper. We offer boxes, ribbons, tissues and even a new floral collection that caters to this trend. We have a lot to share in the Rustic Weddings section. At Wraps, we love kraft! We have an extensive array of natural and kraft packaging products, from tiny linen pouches and burlap ribbons to tall nested kraft boxes. The final section is Destination Weddings. Here we concentrated primarily on beachy and tropical themes and colors! The new Wedding Catalog is full of pleasant surprises! Stay on the lookout for fresh favor ideas, favors that double as place cards, burlap and orchid centerpieces that also stand-in as memorable keepsakes, and basket boxes as dramatic eye-catching centerpieces. And of course, you will find examples of specialty printing throughout our NEW Digital Wedding Catalog! Custom printing is a sure-fire way to create one-of-a-kind celebrations. We can custom print bags, boxes, ribbons, tissue, cello and more. Call our experienced printing staff at 800-547-9727 ext. 4. and get started! See our entire line of digital packaging catalogs here. Carli Maclean is a graphic designer at Nashville Wraps by day, working on catalog and trade show graphics, but by night she is a Zumba enthusiast, a fine artist, and cook extraordinaire. Copyright © 2019 NASHVILLE WRAPS. ALL RIGHTS RESERVED.